Letterpress printed thankyou note in blind (no ink). 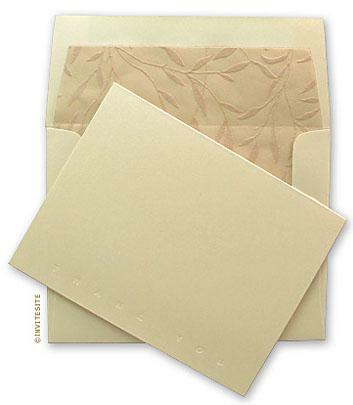 Pearlescent Champagne Italian paper and envelope. With linen colored flocked Thai paper liner. Fold at top - tentfold design. Opens flat to 8.5 x 5.5 inches. Pearlescent champagne cardstock. Matching envelope. Mulberry paper with flocked bamboo design envelope-liner (assembly required - gluesticks included). "Thankyou" printed and scored on a 1910 C&P letterpress - printed by hand.